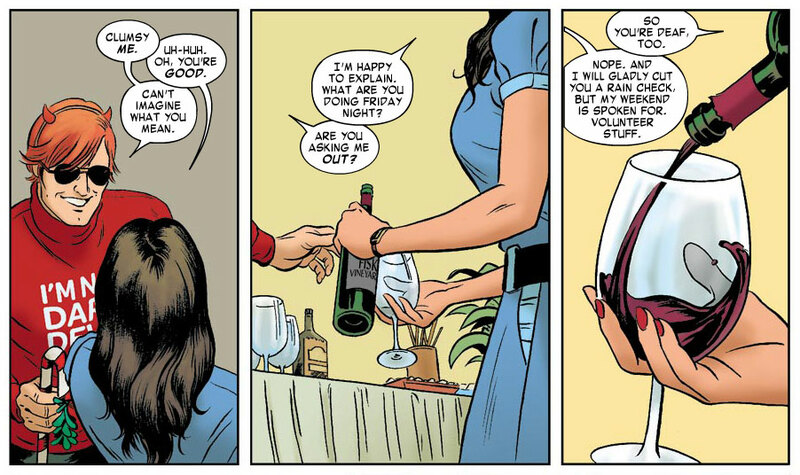 Daredevil #7 is absolutely delightful. Now, that might not be a word often associated with superhero comics – particularly when they feature a character like Daredevil – but this holiday-themed done in one issue is such a perfect mix of inspiration, adventure and charm that I can think of no better way to describe it. The humor is finely balanced with the drama and the story has great depth. I also think this issue may be Rivera’s best effort on this title to date. The art is mind-blowingly good, but more on that below. This story revolves around Matt taking a small group of blind elementary school students on a field trip when disaster strikes and their bus goes off the road, spilling its passengers into harsh terrain and even harsher weather. With their bus driver dead behind the wheel, and Matt injured and nearly as out of his element as his young charges, the group has to make it down the mountain to safety with no guarantees of ever finding it. The plot itself is simple and straight-forward enough, but the package it comes in is pitch perfect. For one, I think this issue is one of the best showcases of Matt’s character I’ve ever seen. A new reader could come into to this adventure with no prior Daredevil experience and walk away with a very full sense of who Matt Murdock is as a person and what makes him tick. It’s great to see the contrast between the internal dialogue, in which Matt is free to both formulate a strategy and express to the readers his doubts and reservations, and his interplay with the kids he’s trying so desperately to keep motivated and moving forward. 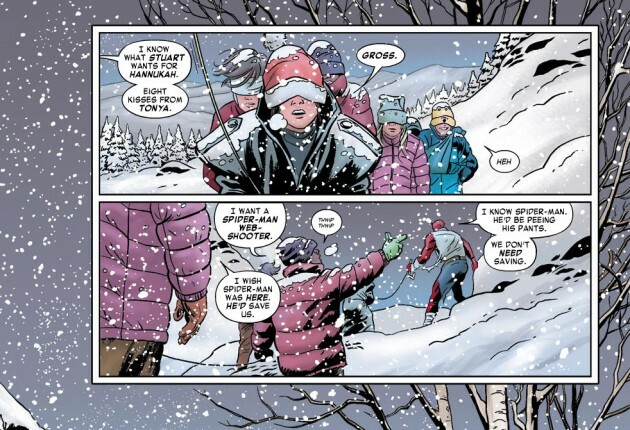 Everything about Matt’s way of relating to the kids feels so real and gives us enough moments of both joy and despair that you have to be amazed at how Waid manages to build a story this rich in the number of pages at his disposal. Amazingly, the story never goes into too sweet territory. Even in the scene where Matt is giving the kids a pep talk about sticking together and helping each other, a speech that verges on sounding cliched, it is the main character who catches his words of encouragement falling flat and reminding himself that he’s addressing a group of scared children – not a football team. The humor sprinkled throughout is spot on without ruining the sense of urgency the group is experiencing. When the happy ending finally comes, as we all knew it would, it doesn’t happy in the way anyone would expect and the story as a whole is much stronger for it. This issue also ties into previous events and advances a couple of plot threads from earlier issues. While Matt is unconscious in the bus wreck, we’re treated to a flashback to a Christmas party at Nelson & Murdock earlier in the week. The flashback includes a rather charged scene between Matt and Foggy which briefly highlights some of Matt’s deeper issues, as well as his best friend’s obvious concern. In stark contrast to this encounter, we also get to see Kirsten McDuffie make a move on our favorite lawyer. Yes, a date is in the cards for these two! As the image of Kirsten begins to fade, the past gives way to the present in a cleverly drawn sequence of panels. This brings me to topic of the artwork. I think I’ve said before that, to me, Rivera’s art is elegant and that’s certainly the word that comes to mind with this issue too. The scene where he’s hugging the girl he just saved from the flames of the wreck reminds me of David Mazzucchelli and the landscape scenes are breathtaking (page one, I’m looking at you). The creative use and placement of panels, such as those sprinkled across the page of the bus going off the road, do so much to take this story another level. The kind of details seen in the image below, with Rivera demonstrating Matt’s limping gait by showing the uneven pattern in the snow and how the kids fall silent with one child each in three subsequent panels. Awesome! Mark Waid and Paolo Rivera are such a great fit for each other on this book that for them to be a more perfect match, they’d have to be siamese twins. And yes, I know that’s a weird thing to say (also, I guess you’re supposed to say “conjoined twins” these days) but it’s clear that these guys have amazing creative chemistry. Kudos also to the rest of the art team. Who would have thought this title would be Joe Rivera’s first time inking comics? Javier Rodriguez’s color palette is amazing as well with the warm hues of the party contrasting with the icy pastels of the wintery outdoors. The final page of this book provides a nice piece of foreshadowing though I have to admit that it took a me a beat or two to figure out exactly what I was looking at. For this, I don’t blame the art team but rather the experience of operating through the fog of nasty cold. I suspect the lead dropped here will be picked up again in issue #9 rather than in next month’s cross-over with Spider-Man. 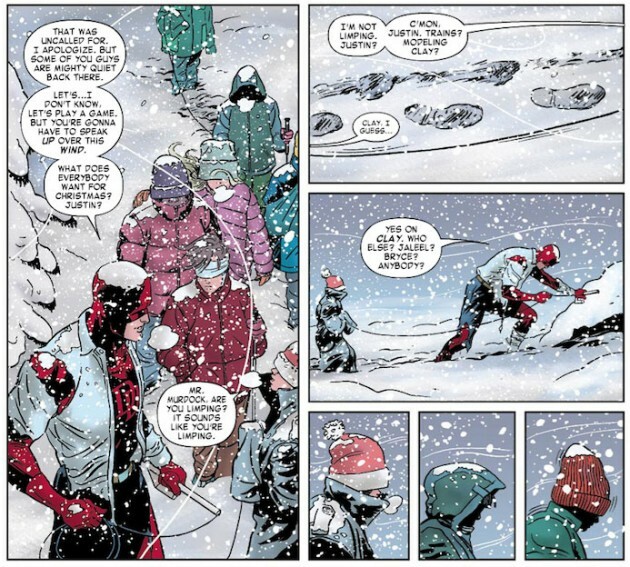 All in all, this is one AMAZING issue and with the holidays coming up, those of you who know you have a friend or relative that might enjoy the comforts of the warm yet complex blanket that is Daredevil #7 owe it to them and the world to pick up an extra copy and stick it in their stocking. This truly was an amazing issue. I have a long history of failing predictions on what’s to come in the story, but could the last page hint to the return of Hellspawn, the voodoo copy of DD? Totally agree on this one! I thought it was brilliant. And details? How about the vino being quaffed is from Fisk Vineyards? Hahaha! Brilliant. This really is a fantastic issue! Great issue. Rivera’s art continues to amaze me. Injecting so much humor into Daredevil could have been a massive failure under a lesser writer, but Waid continues to knock it out of the park. Hi Christine, been reading for a while but didn’t comment before. Great site! When I read this a few weeks ago I didn’t get that the kids on the bus were blind. I assumed they were sighted because after the accident, Matt pulls their hats down over their eyes (because the tearing of his street clothes exposes his spandex outfit). I’m going to have to read this again, aren’t I? Hey, Simon! Thanks for your comment and thank you for reading! I’ve seen LOTS of people comment that they also didn’t realize that the kids were blind so you’re not alone. I’m a little surprised by it though since all of them clearly have white canes, although it’s not actually said outright by anyone that they are blind so I guess if people are missing that one crucial detail (and the writing on the side of the bus) it’s easy to see why one might not realize right away. I think Matt would be wise to pull their hats down both for their and his protection though since total blindness is actually relatively rare and if this were a real group of blind kids chances are at least a few of them might be able to see some shapes and colors. I guess it’s better to be safe than sorry! I really do need to read that again, don’t I? I didn’t notice either the white canes or the signage on the bus. I wonder how much does escape my notice when reading comics! I am so pathetically behind, so I just read this issue today on the MCDU. I thought they were blind after the part where Matt mentions that they’re more anxious about the outside world. I didn’t catch the white canes or the sign for some reason. Just re-read this issue for the second or third time. I really love this story both for being self-contained and for storyline that, for once, has a happy ending (except for the bus driver). Also love DD making a snow angel on a NYC water tower.